How Many Eyes Does A Mosquito Have? Mosquito bites are found on dogs just as much as on their owners. When mosquito season rolls around, many of us will arm ourselves with repellent, but we may forget that our dogs also need protection. Mosquito bites can be incredibly irritating and sometimes painful for dogs, so if your pup fell victim to mosquitoes, you’ll want to find a way to treat bites they receive. Dogs, in particular, should avoid being bitten by mosquitoes as mosquitoes can transmit heartworms, which can embed themselves in your dog’s vital organs and cause havoc; mosquito bites can also pass on other bacteria and illnesses. Mosquito bites are uncomfortable and your dog may wind up causing more damage as they attempt to scratch or gnaw at their bites. In order to save your pet unnecessary discomfort and keep them from further harm, we’ll teach you how to treat their mosquito bites. How Do You Treat A Bug Bite On A Dog? If you find a mosquito bite on your dog, there are several ways you can treat the area at home to ease your pet’s discomfort and keep the bite from becoming a more serious issue. We have outlined how you can treat your dog’s mosquito bite in the bulleted list below and we will also detail how to avoid future bites later in this article. The methods in this list work well for standard mosquito bites and can also be used to treat other bug bites, such as flies or fleas. If at any time you notice excessive swelling or itching, consult your vet and they will be able to prescribe medication to help with the symptoms. Bathe in cold water. If you notice your dog has mosquito bites, a trip to the tub is the first step in treating them. The cold water will soothe your dog’s skin and can help reduce the swelling around the bites. You can even add a small number of Epsom salts to the bath water and let your dog soak. While bathing, you may want to use an oatmeal shampoo. The oatmeal helps calm your dog’s skin and can reduce any further irritation. Soak a cotton ball in witch hazel. Witch hazel has so many wonderful purposes, it’s not surprising that it can also help treat your dog’s mosquito bites. If you are looking for a more natural remedy, witch hazel is an amazing choice to reduce inflammation and ease any discomfort. Soak a cotton ball in witch hazel and apply to any mosquito bites you may find, then send your pup on their way. Reach for antibacterial cream. As we mentioned before, mosquitoes carry many bacteria and diseases. If you find a mosquito bite on your dog, you’ll want to keep it from getting infected by using an antibacterial cream. Apply a thin layer over bites you may find (try to keep your dog from licking this off.) Repeat daily until the bites go away. If you do notice any growing swelling and discoloration or if the bite begins to retain pus and emit heat, please contact your vet about a possible infection. Stop swelling with hydrocortisone cream. In addition to antibacterial cream, you may want to purchase some hydrocortisone cream for your dog’s mosquito bites. This cream will reduce inflammation and can help ease any discomfort the bites may be causing. This cream from Zymox is a great option. Apply in a thin layer several times a day (as needed) to treat swelling. Please note that hydrocortisone cream can be dangerous if ingested, so only apply this to areas your dog can’t lick or give them a head collar to keep them from getting at the areas you’ve applied the cream to. In addition to these treatment options, you can always look into medications like Benadryl to assist in treating your dogs’ mosquito bites. If the bites are particularly bad and these solutions aren’t working for you, please reach out to your vet. They will be able to create an individualized treatment plan that will have your dog recovering from their mosquito bites in no time! How Can I Soothe My Dogs Mosquito Bites? Much like people, dogs experience discomfort when they are bitten by mosquitoes. 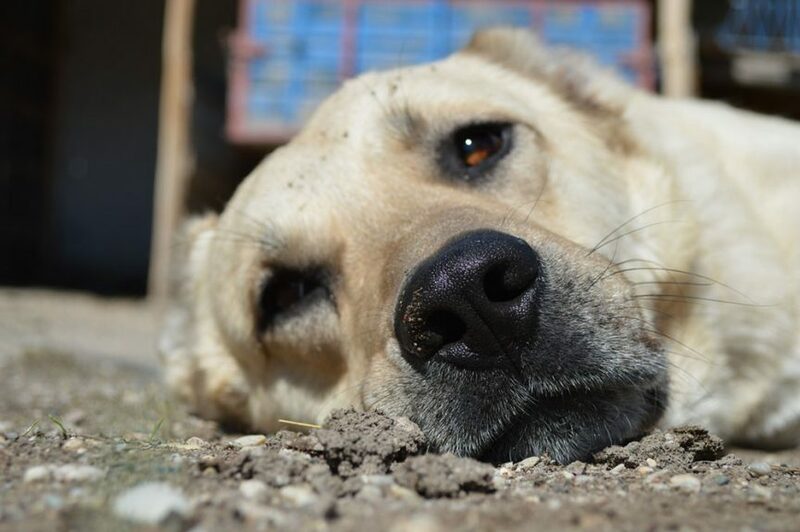 Because they can’t talk and tell us they are suffering, you’ll want to keep a close eye on your dog during mosquito season to make sure they don’t have any bites. Keep an eye out for telltale scratching and routinely check areas that are especially susceptible to mosquito bites. If you notice your dog suffering from their mosquito bites, no doubt you’ll want to find a way to help ease their recovery. Luckily, there are tons of solutions out there to soothe mosquito bites that are safe for your furry friend! Make sure your dog doesn’t scratch the bite too much. Baking soda is also safe for dogs to consume in small quantities, so you don’t have to worry about them getting sick if you catch them licking at the paste. That’s the great thing about these non-chemical remedies, all you need to do is prepare them and make sure to apply them correctly. Oatmeal is another great solution for soothing painful mosquito bites. Consider bathing your dog with cold water and oatmeal shampoo if you notice they are expressing discomfort or if they have multiple bites. The oatmeal helps soothe their skin and cut down on any discomfort and itchiness. You can also purchase a professional anti-itch oatmeal spray that will provide similar relief, but without the need for the feared bathtime. If your dog’s mosquito bites are incredibly swollen or showing signs of infection, consult your vet for a medical solution. They can prescribe medication that will help calm any particularly nasty bites and provide relief for your pooch. You may also want to talk to see if your vet has any “home remedies” of their own: Practicing animal medicine certainly gives you a leg up on the average pet owner, so they may have advice we haven’t heard yet! Can Dogs Get Mosquito Bite Bumps Or Swelling? The effect of a mosquito bite is similar for dogs and people. An itchy bite will leave a small red swelling on the skin of the dog. This can get quite annoying for your dog over time. The bump you see is a pocket of mosquito saliva: It can continue causing a reaction a few days after the initial bite. When checking your dog for visible mosquito bite bumps or swelling, check out the areas of your dog’s body where the fur is thinnest. Ears, noses, and underbellies are the most common areas for mosquitoes to bite your pet. You can usually tell where the bites are by your dog’s behavior. They will try to scratch at or chew the mosquitoes bites to try and alleviate their itching. If you catch your dog scratching at his ears during mosquito season, stop them and make sure to thoroughly check for any bite bumps or swelling so that you can treat them properly. How Do I Protect My Dog From Mosquito Bites? Check any windows and door screens in areas of your home your dog likes to spend time in. A torn window or porch screen can allow in mosquitoes that will make a meal of your dog. It can be tempting to reach for your own bug repellent spray for your dog, but never use human insect repellent on your pooch. Most commercial repellents contain chemicals that are harmful for dogs and can lead to serious medical concerns. Instead, look for pet-safe bug repellent sprays or products. K9 Advantix makes topical repellents for both small and large breed dogs to keep them protected against mosquitoes. You can also look into a more natural solution, like this organic insect spray from VetOrganics. There are also clothing products available for dogs to protect them from mosquitoes. You might consider purchasing an insect shield shirt for your pooch that will create a physical barrier between their delicate skin and a mosquito’s harmful bite. These shirts are also infused with pet-safe permethrin (a man-made version of Chrysanthemum flower extract) that naturally protects them from harmful pests. What Is The Best Mosquito Repellent For Dogs? Luckily, we have already written an article explaining the best natural mosquito repellents for dogs. I will be touching on those repellents here, but I strongly encourage you to read that article as well. We have additional repellent tips listed there and explain the solutions below in greater detail. As mentioned in the point above, insect shield shirts are a wonderful way to repel mosquitoes from your dogs. They create a barrier that a mosquito’s mouth cannot penetrate. The material they are made of is also infused with an extract that naturally repels mosquitoes and is incredibly lightweight, so you don’t have to worry about your dog overheating. The repelling properties will also last even after the insect shield is washed. Along with insect shields, repellent blankets are another physical product that can keep mosquitoes away from your beloved dog. Put one in your dog’s kennel or bed and mosquitoes won’t dare come near. Like insect shields, they are infused with a certain extract that will last even after being washed. There are also organic mosquito sprays (like this one from Vet’s Best) designed to repel mosquitoes without any harmful chemicals. You can spray this in your yard to keep your dog’s walking area mosquito-free. It is also safe for plants, so you don’t have to worry about bleaching your yard. Consider pairing this spray with a repellent ointment you apply to your dog’s skin for thorough protection. If you are looking for a way to repel mosquitoes without having to remember to re-apply an ointment or dress your dog in a repellent shirt, I recommend a repellent collar. Dr. Mercola makes an herbal repellent collar that is infused with a special blend of herbal oils to repel mosquitoes. It’s easy to put the collar on your dog and allow it to repel mosquitoes for up to four months. Can I Give My Dog Benadryl For Mosquito Bites? Be cautious with using Benadryl for mosquito bites. Only give your dog medication that is prescribed or recommended by a vet. Inform with a medical professional to make sure it is safe to give your dog Benadryl. If your dog is on other medication, the Benadryl could also interact with those medications and create an adverse effect. If you are looking to give your dog Benadryl to help with their mosquito bites, a safe dosage is one milligram per pound that your dog weighs. Try to limit using Benadryl as much as possible, giving it to your dog once per day at most. If you accidentally give your dog too much Benadryl, it could cause an overdose that creates even more issues. The antihistamine properties of Benadryl will help with any swelling and itching they are experiencing, so they will be less likely to continue scratching at their bites and risk causing infection. You can also apply Benadryl ointment directly to any mosquito bites you find. Keep in mind that Benadryl does cause drowsiness, so don’t be alarmed if your pup decides to take a nap after you give them a dose. How Long Does It Take For An Insect Bite To Heal On A Dog? An insect bite on a dog will heal itself after some time. If the bite is left alone (ie, no scratching or treatment), itching should subside after three or four days. Any discoloration will also have faded or are barely visible. After a week, the swelling should have greatly reduced and the bite itch should be gone. After this time, you can consider the mosquito bite to be completely healed and you won’t have to worry about any potential infection risk. Unfortunately, your pet is likely to aggravate any mosquito bites by scratching or gnawing. This is why it’s important for you to regularly check your pet for any signs of mosquito bites. If you notice them constantly scratching at a certain area, make sure to look them over for any swelling or discoloration that could indicate a mosquito has made a meal of them. If your pet has aggravated their mosquito bite, healing time could increase. A bite that isn’t properly healing may take two weeks or more to heal. 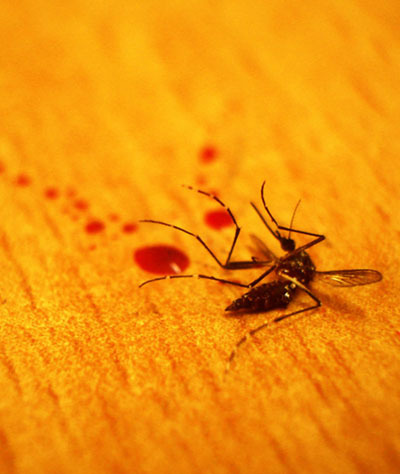 Treating a mosquito bite can also affect the time it takes to heal the bite wound. If you are consistently treating the bite and your pet hasn’t been allowed to irritate the area further, healing time may be reduced several days. Don’t be discouraged if you notice healing still seems slow even with treatment: every dog reacts to mosquito bites differently and their healing rates are also unique. If you feel a mosquito bite is taking an unusually long time to heal, check with your vet to ensure there are no complications (like allergic reaction or infection) that are impeding the healing process. When the next mosquito season rolls around, don’t allow your precious pooch to fall victim to the mosquitoes probing bites. Remember to keep them protected and try to keep them indoors as much as possible, especially during the hours in which mosquitoes are most active. Your furry friend may not be thrilled about less time running around the yard, but think of fun activities you can do indoors away from mosquitoes. This is a great time to consider teaching your dog a new trick or just to spend some time curled up on the couch together! If your dog is unlucky enough to be bitten by a mosquito, though, this article should have you prepared and able to treat their mosquito bite. Remember to regularly check your pet for insect bites. You’ll want to pay close attention to the areas where their fur is thinnest, so routinely inspect their ears and faces for any telltale swelling or discoloration. If your dog does have a bite that doesn’t seem to be healing or is looking worse for wear, please contact your vet. Your vet should also be able to provide additional tips to protect your dog from mosquitoes and will be able to advise on home treatment options. If you enjoyed this article and want to know more about keeping your family safe from mosquitoes, please check out the rest of our site. We have a very informative list of recommended mosquito repellents that will help all of your family (including the furry members) stay bite-free this mosquito season. All of the products in this list are things I have personally tried and found incredibly effective at keeping mosquitoes away. With so many great solutions for protecting yourself and your loved ones from any flying pests, worrying about mosquito bites will become a thing of the past.